Just made this new video. I hope you like it. This tester is made of an simple low cost stainless steel kitchen scale (brand: Impuls), which cost about €10,- or $13,-. The weight sensors are located in the four scale feet. That's why you need a plate under this kitchen scale. The stainless steel is not magnetic. Only the metal strip is magnetic and is about 3-4 mm (1/8"-5/32") thick. The width and length of the strip doesn't matter much. It is more important that it fits in between the screws, cables, electronics and the rear wheels of your slot car. The hight of the strip is crucial though. If you make it somehow adjustable, you can make it work like your slot car club's scale. I spent two evenings time making this magnet downforce tester. Good luck with yours. 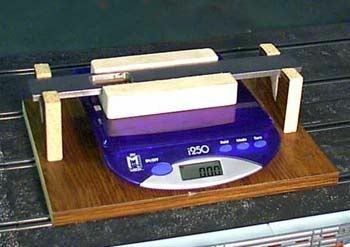 With this scale you can test the downforce of the magnets inside a slot car motor on the metal power strips of the track. If you have a copper taped or tinned copper braid track then there is no magnet downforce at all. Last edited by ginkejw; 08-13-2018, 09:44 PM. We were using testers like this years ago. My club had three tracks at the time and each one had its own tester. We used a calibration magnet to keep the testers in sync. Some types of stainless steel are magnetic, you would need to check that. Last edited by RichD; 03-23-2018, 06:37 AM. Very nice Hans. Great video. This is exactly what I was looking for, a scale that measures at the feet!